The Sun Gate also called Intipunku in Quechua was once a guardhouse that marked one of the principle entrances to Machu Picchu. The large lithic enclosure features big windows and doorways, and once had a thatched roof. It is located at 2,720 meters (8,924 feet) above sea level, and 290 meters (951 feet) above the Urban Sector of Machu Picchu. Following an original Inca Trail, it takes approximately 90 minutes to hike to the Sun Gate from the Guardhouse at Machu Picchu. The strategic location of the Sun Gate leads historians to believe that the entrance to Machu Picchu was restricted. Imperial guards kept efficient control over all entries. For this reason it is thought that this city welcomed only selected visitors of the imperial elite. The Sun Gate is where hikers from the 4 days classic Inca Trail entering Machu Picchu get their first glimpse of the citadel. A moderately challenging trek to the Sun Gate (Inti Punku) that was once the main entrance to Machu Picchu. 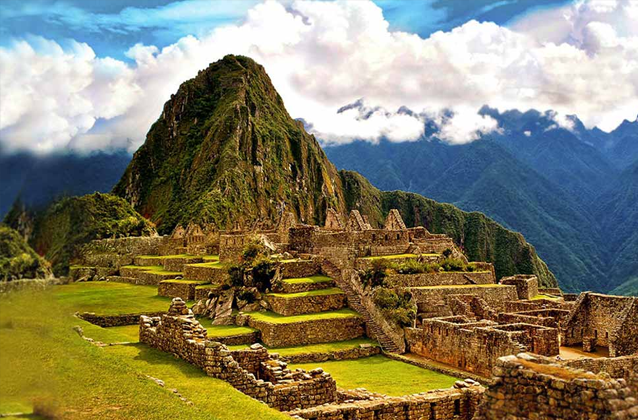 The hike follows an original Inca Trail that steadily climbs though Machu Picchu’s agricultural terraces high in to the mountains directly south of the citadel. The trek is free to enter and takes about 3 – 4 hours to complete (round trip). From the main entrance gate of Machu Picchu follow the upper trail around Machu Picchu (see trail head map below). At the Caretakers Hut (or Guardhouse) you need to turn left and follow the path that leads away from Machu Picchu through the agricultural terraces. Wooden signs stating Inti Punku clearly mark the way. There is no official trail head for hiking to the Sun Gate, but you could consider the start to be at the Caretakers Hut (or Guardhouse) view point. From the Caretakers Hut (or Guardhouse) view point, the trail follows a straight path along an original stone stepped Inca Trail. Unlike the tougher Machu Picchu Mountain Trek which runs nearly parallel, the Sun Gate Trek follows a path which is more gradual at no more than 30 degrees in angle. As you approach the Sun Gate the trail becomes more inclined and a little tougher (the last 20 minutes). The Sun Gate Trail is also the main entry point for hikers finishing the classic 4 days Inca Trail to Machu Picchu, and if decide to trek to the Sun Gate before 10 am in the morning you will be sure to meet Inca Trail trekkers coming the other way. Imperial guards used the Sun Gate to control entrance to Machu Picchu. It’s remote location was strategic and for this reason it was believed that Machu Picchu only welcomed selected visitors of the imperial elite. The trail continues past the Sun Gate for another 2 hours to the last control point of the Inca Trail at Winay Wayna, another beautiful Inca citadel. Entrance past the control point is restricted and special Inca Trail permits are needed to enter. For this reason most people finish the hike at Inti Punku. Entrance time: Can enter anytime during the regular opening times of Machu Picchu. Not recommended to start any later than 2pm. Trail head: Located close to the Caretakers Hut in the Agricultural Sector of Machu Picchu. The Sun Gate Trek is accessible all year round. During the wet season (November – April) there is a higher chance of heavy rainfall. The region has a sub-tropical feel throughout the year with average daily temperatures of 18 °C (64 °F). During the dry season the humidity is around 40 – 45%, rising to 60 – 65% during the wet season. Early morning trekking offers cooler temperatures and better shade from the sun. The weather in this region of Peru can often be unpredictable any time of the year, so you must be prepared with clothing for rain and sun. The Sun Gate trek is made up of dirt track and many stone steps, so comfortable lightweight training or hiking shoes are recommended. A light weight rain coat or poncho and sun protection is advised. It is recommended to take one small bottle of water on the trek. 1 ½ – 2 litres of water.